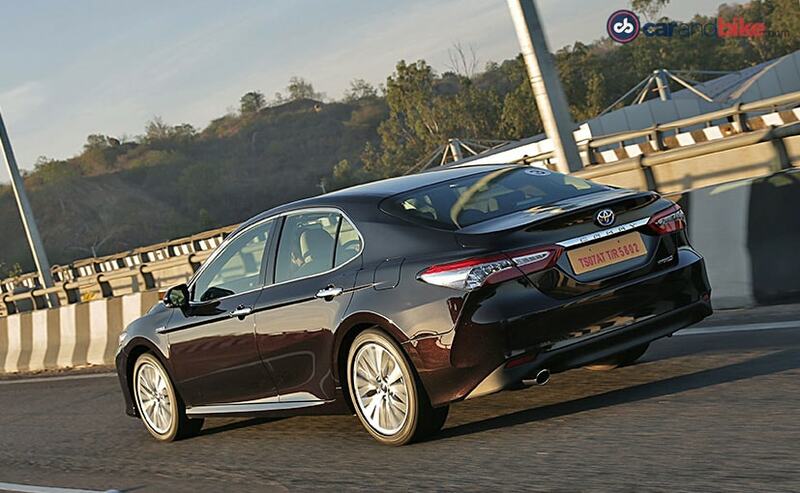 The new generation of the Toyota Camry Hybrid, looks better than ever before but how well does it drive? 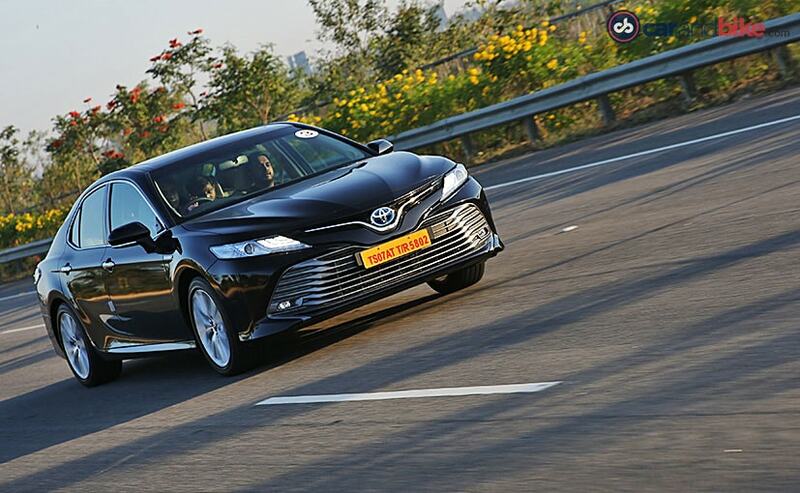 When I think about the new generation of the Toyota Camry hybrid, I drove in Hyderabad, I couldn't help but draw parallels to the car and Greek mythology. I know that this statement has already got you thinking, but bear with me, I have a sort of long winded explanation to it all. Toyota's attempt at producing the Camry hybrid can be compared to the Greek Gods' - Zeus and Prometheus - effort to make human life possible. It's well known that both the gods, structured humans out of Gaia (Mother earth) and well, Athena breathed life into them. They were the perfect beings and we can liken their existence to electric cars. But of course, Zeus wanted more calibrations to be made and well, that's how demi-gods or hybrids were born. The same is the situation with the Camry hybrid. At a time when electric vehicles are making a strong statement out there, the demi-god - Camry, which brings together the best of both the worlds (electric and ICE), attempts to break the monotony and emerge as a power to be reckoned with. Toyota has done a lot to popularise hybrid technology and no other car brand can boast of that. The development of hybrid powertrains continues to this day, although there are a whole bunch of carmakers, who see that the grass is greener on the other side. 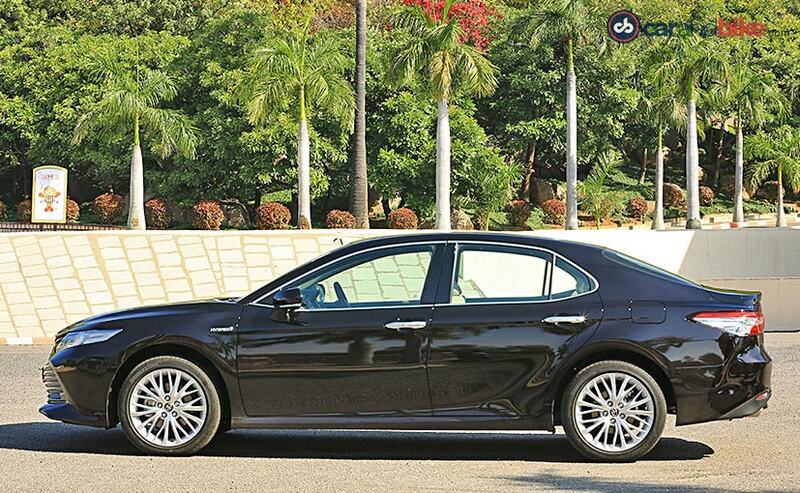 Toyota, with the Camry hybrid, has found success in India too. The predecessor of this car saw sales of the hybrid version cover 70 per cent sales of the sedan, while the remaining 30 were attributed to the petrol variant. 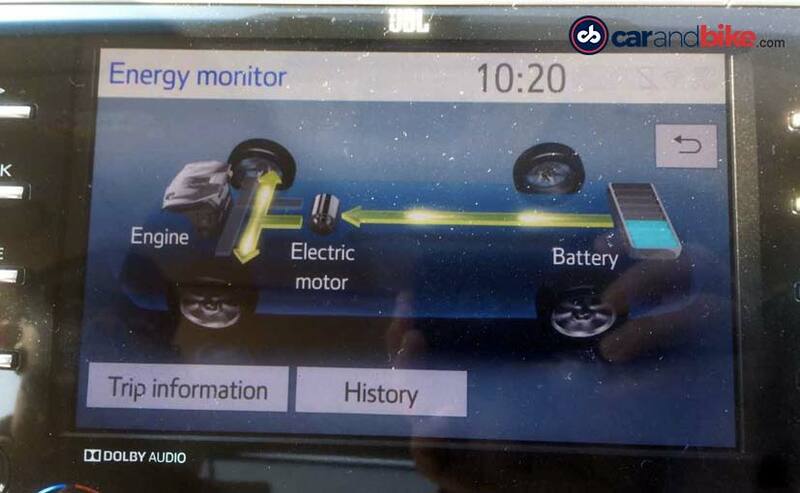 So this time around, Toyota thought of bringing in just the hybrid variant of the Camry to India and with it we might just see the hybrid systems make their way into more cars. The eighth generation model of the Camry is quite the looker. It's grown in proportions; and well, it looks smashing. You could credit some of those styling elements to Lexus and the influence is uncanny. Up front, you have this beautiful looking front grille, which doesn't make it look boring at all. 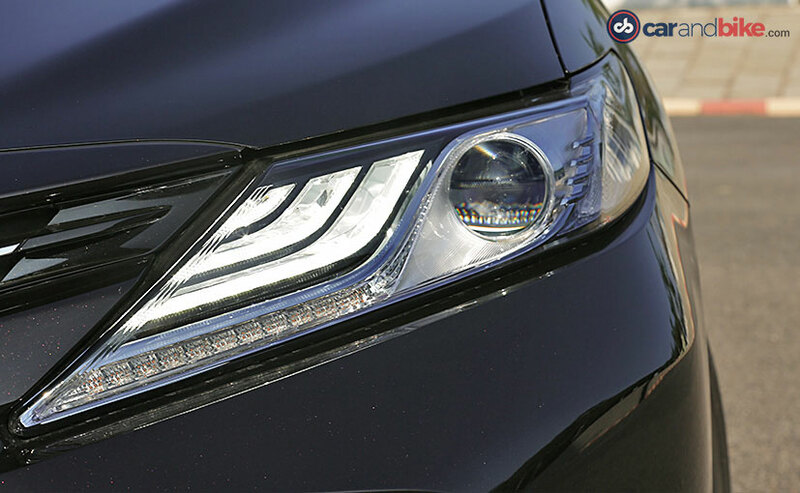 There are of course LED headlamps and the LED DRLs, which give the Camry its signature look. If you want to give credit to anyone for its new looks, well, thank Toyota CEO - Akio Toyoda, who said that all the company's new products will show off a stylistic passion; and yes, it shows. The curves on the sides and the lines on the hood, all bring out that muscular look of the Camry; and yes, we love it. Move to the rear and you see the seamless design element flow from the front to the rear. The slim tail lamps complete the new look of the Camry and the blue that you see on the Toyota badges up front and rear shows off that you're using a hybrid car. There's a lot more style on the inside too. It gets the new age Y design on the dashboard, which shows off the seamless transition of the design and if you sit in the driver's seat, well, you'll understand that it's all very driver oriented, right from the cockpit like view of the instrument cluster to the 8-inch touchscreen infotainment system. The biggest change here though is the diameter of the steering wheel, which has reduced and makes it a bit more sporty to look at. And there's no wooden element on the steering wheel anymore. The passenger space is virtually unchanged and the glass area remains plentiful, so that the cabin once again feels roomy, airy and open. The fit and finish is excellent and the cabin oozes its 'premium' nature. You get features like onboard navigation and Bluetooth connectivity. However, a big miss for Toyota is Apple CarPlay and Android Auto and though there is Mirrorlink, it's not compatible with all phones. But, it now gets wireless charging and a 10-inch heads-up display. 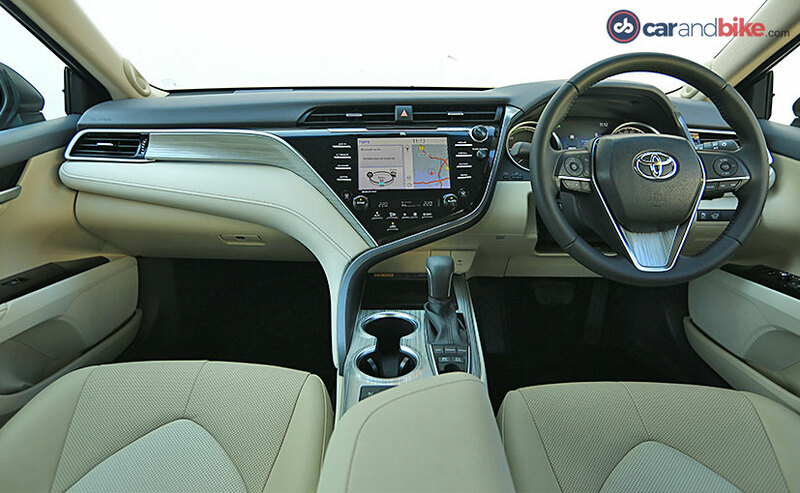 Moreover, it continues to be packed with premium features, like a moonroof, electronically adjustable driver seats with memory function, electronically adjustable ORVMs, rain sensing wipers, cruise control, Electronic Parking Brake and more. And the beige leather seats look great, in fact there are ventilated seats and we have always loved that feature. If you are impressed by that, there's more at the back. You get a 3-zone climate control system and even rear power sunshade. 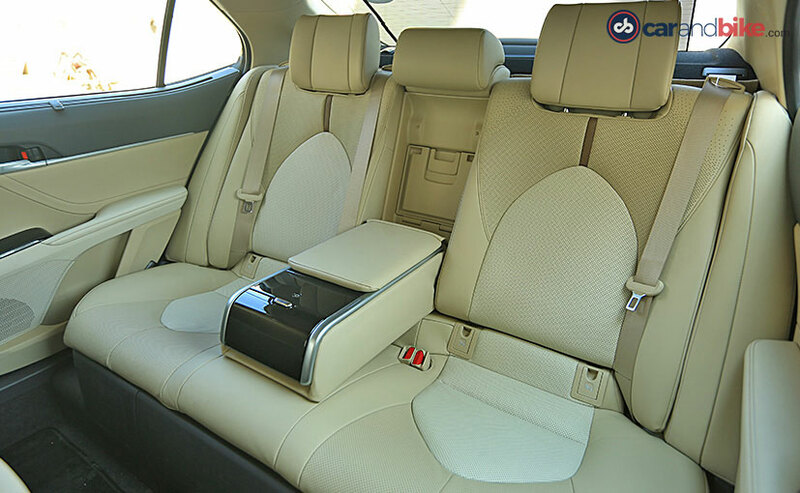 But, the big features are the reclining rear seat, which adds to the comfort of the passenger seated here and of course the touch controls on the armrest, which take care of your air-con needs as also help you browse through the infotainment system. Then, there are cup holders too and two USB ports at the rear, something that shows how new-gen the car's become. 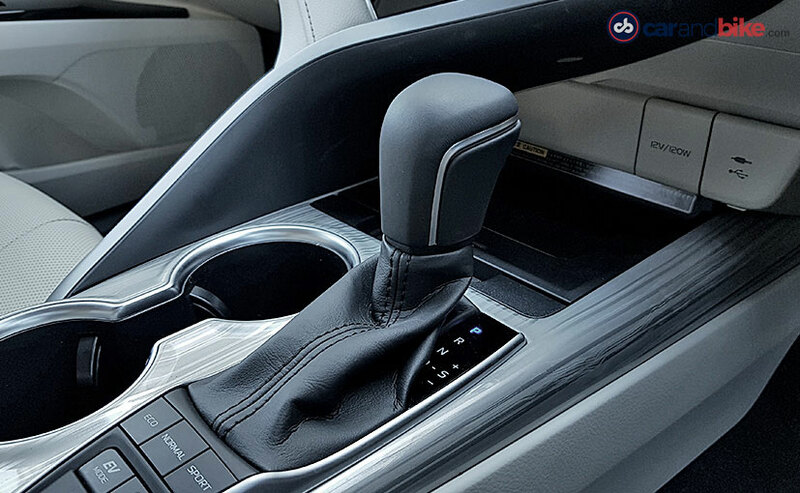 But, with the new generation of the Camry, it's not about sitting at the back any more. Thanks to the TNGA platform, it's longer, wider and even lower than its predecessor. So, it's not surprising that the company is talking about how sporty it's now to drive, which is why I got into the front seat and took it out for a spin. It gets a 2.5-litre petrol engine and there's the electric battery at the rear. The function is however the same as before. The petrol engine, which churns out 176 bhp, feeds power to the 118 bhp churning Nickel-metal hybrid battery and well all of that process is rather seamless. The total output, from the petrol and electric motor stands at 215 bhp and yes, it's enough for a car this size and we must say there's a big difference in the way this one drives. There's also regenerative braking, which helps in fuelling the battery too. The Camry hybrid starts in the EV mode, always; and yes, you can do an all EV mode too, which sees zero emissions, so yes, you are saving the planet with this one. The EV mode drive doesn't last long. According to Toyota, the Camry Hybrid, produces up to 2 tons less CO2 per year than an equivalent car, in the same class. The engine is mated to a CVT unit and there's a flappy paddle gearbox on offer. It reacts well to your urgent inputs and it's all very well executed. The CVT gearbox though could have been a bit more responsive. 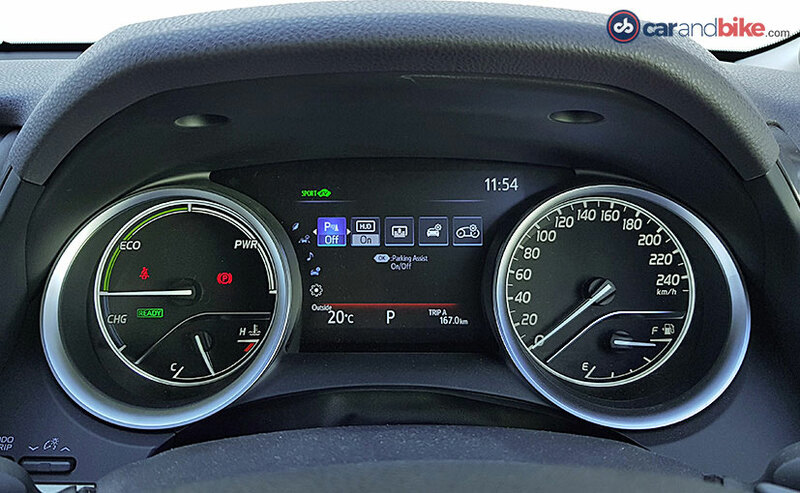 In the Eco mode, it's extremely dull but in the normal and the sport modes, the response is much better. Toyota has added a manual mode too that enables the driver to sift through six simulated gear steps; but it had little effect on the way the gears shift. There's a big roar before the gear shifts and though the company has done well to curtail the sound from seeping into the cabin; above 3500 rpm, things get a bit noisy. 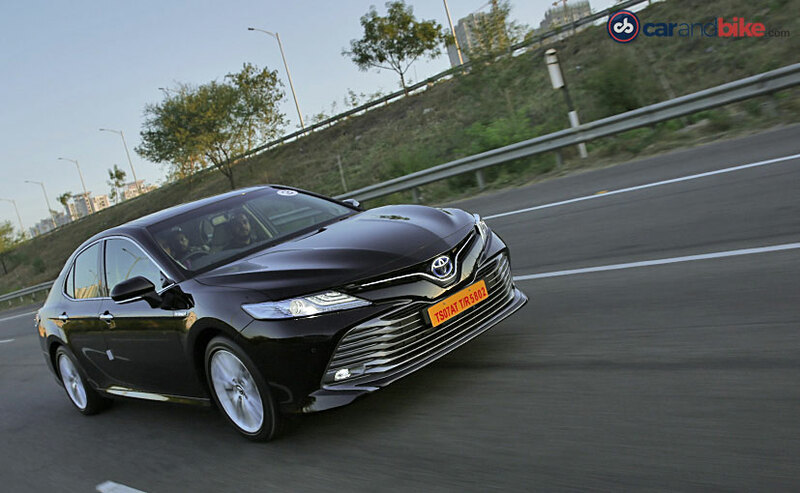 The new-gen Camry has benefited massively from the switch to the TNGA underpinnings-the body's torsional stiffness has increased by 30 per cent and the old car's rear struts are replaced with a double wishbone setup. The Camry feels more composed now and even the larger bumps are dealt with ease, with no aftershake. We can officially say that the Camry is now a sporty car. Now that's one word you'd never associate it with, over all the years it's been in the country. Yes, you want to now get into the front seat and want to drive it and it's because everything is tauter now and you don't even mind throwing it into a corner and come out with a smile on your face. 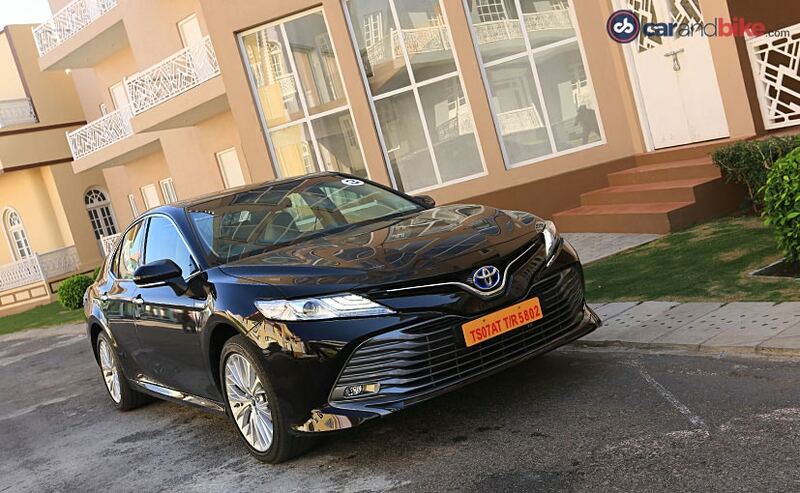 The modes do not alter the suspension setup, but it's got just the right bit of sportiness and comfort, all of which work in the favour of the Camry. Finally, it's got everything to take on the likes of the Superb and even the Passat. While it might have the right mix to stand toe-to-toe with the likes of the Passat and the Superb, what about the price? Well, Toyota has an upper hand there too. It's priced at ₹ 36.95 lakh (ex-showroom India) and these are introductory prices. This price tag makes its cheaper by ₹ 27,000 when compared to its predecessor and close to ₹ 7 lakh cheaper than its direct rival - the Honda Accord Hybrid. The hybrid then takes the fight to the Passat and even the Superb here, which, though priced lower, do not get to boast of a hybrid powertrain. With the new generation of the Camry then, you certainly see Toyota taking a leap in terms of looks, drivability and sustainability too. It's the right mixture then, and you could hear even Zeus and Prometheus say this when demi-gods were born. So you see, even the Gods loved hybrids; we, on the other hand are mere mortals.